I’m travelling in the Snowy Mountains this week – yay for a Winter wonderland. But wanted to drop by and share my latest discovery. Yes we’re talking home made falafels. I can’t believe it’s taken me this long to have a crack at making these wonderful Middle Eastern staples. I still remember my best falafel and hummus experience, EVER. I was travelling in Jordan and had to spend a couple of days in the capital, Amman – not the most exciting of cities. I was a bit unhappy about having to stay there but I decided to go out walking and make the most of it. Somehow I ended up finding this little hole in the wall restaurant that was really packed – always a good sign. So I decided to give it a go. At the front of the restaurant was a man cooking with a pot that looked like a giant wok filled with oil. One after the other he was pumping out the most beautiful falafels I’d ever seen. After snagging a table, the efficient staff brought hummus and flat bread – I love when there’s no need for ordering. Just sit tight and wait your turn. Soon a plate of the freshest falafels were plonked down and I didn’t waste any time wolfing them down. And what a revelation. Light and crisp and bursting with nutty freshness – a whole world away from the reheated falafel rolls I’d experienced in Australia. Between the falafel joint and a little bakery I found that sold warm flat bread drizzled with olive oil and za’atar ( a spice blend of sumac, thyme and sesame seeds), I found myself reluctant to leave Amman. But travel on I did, taking with me the memory of those perfect falafels and the mental note that one day I’d make them myself. It’s been over 10 years since that trip to Jourdan and for one reason or another, I’d almost relinquished the dream of making falafels. But something inspired me a few weeks ago. Possibly my new-found frying confidence after tackling the perfect home made potato chip. I’m not sure really. But I decided to make my own falafels and I’m excited to announce that they not only met, but exceeded expectations. And now I have a lot of lost falafel time to make up for. It’s enough to make a dedicated omnivore think about having a fling with veganism. Hummus is such a wonderfully versatile condiment. I could happily eat it for every meal. It’s lovely on it’s own with some flat bread (or Irish Soda Bread – as I discovered when I was in the Emerald Isle earlier in the year). It’s also wonderful as a sauce or a sandwich spread. It’s pairs wonderfully with lamb but it’s soul mate is well and truly fresh falafels, hot from the pan. If you prefer to cook your own chickpeas from scratch, by all means do so. But I find I get even better results with canned chickpeas. The secret to great hummus is to use some of the chickpea cooking (or canning) water an pureeing everything for a good few minutes to make it lovely and smooth. If you don’t have a food processor, don’t let that stop you. Just mash everything together with a fork – the result will be a little more rustic but will still taste divine. Drain chickpeas, reserving the canning water. Pop chickpeas, 3 tablespoons of the canning water, lemon juice and garlic in a food processor. Whizz for a few minutes, stopping to scrape down the sides once or twice. Add tahini and continue to whizz until everything is lovely and smooth. Taste and season with salt, pepper and perhaps a little more lemon juice. You can prepare the falafels ahead of time and keep them in the fridge until you’re ready to fry. While cooked falafels can be reheated in the oven, they’re no where near as lovely when they’re hot out of the oil. It’s important to have your oil hot enough, otherwise the falafels will fall apart. As I discovered myself, the texture can be really varied depending on how tightly you press the balls when forming. The tighter, the less likely they are to fall apart, but the heavier the texture. It’s worthwhile experimenting a little to find the balance between lightness and falling apart. I think the best thing to do with falafels is serve them with pita bread, hummus and tabbouleh – like my quinoa tabbouleh I posted about recently. Whizz bread in a food processor until you have chunky crumbs. Add chickpeas, onion, parsley, cumin and a little salt. Whizz again until you have a paste that is still a little chunky. Using a tablespoon and your hands form into rounds or little logs that are about the size of a walnut in its shell. Heat enough oil to just cover the falafels in a medium saucepan until very hot. When a piece of bread browns in 10 seconds or so, add about 1/3 the falafels and fry for a few minutes or until deep brown. Remove and drain on a wire rack. Keep warm while you repeat with the remaining batches, making sure the oil is hot enough between each. For those of you interested in a wonderful new food website it’s worth taking a look at GourmetRabbit. I have 3 annual memberships to GourmetRabbit (worth $AU22.95 each) and a copy of GourmetRabbit Issue #1 (worth $16.95) for 4 winners. To be in the running to win, subscribe to stonesoup by email before 31st August. Loooooove hummus! I think I’ll make some later this week. I use dried chickpeas, though… would the liquid in the can provide much flavour? Can somebody check the ingredients list…? My 18 -year -old son will be staying with me in a few weeks, and one of our projects is to teach him a few simple recipes. He doesn’t eat much meat, so this might be a perfect place to start. What kind of oil do you use for frying, Jules? I remember almost living on falafels when I travelled in Jerusalem. There was a stall near the Damascus Gate. Or when I was in Heraklion, in Crete, with lots of chips, or Santorini with a beer at sunset, or Hurgada in Egypt, or …. I make both falafels and hummus at home now, but it’s not quite the same – somehow it’s less romantic when I do them in my kitchen then buying them near the Damascus gate. I put dried chickpeas, in the blender (which gives a great fine powder) to get my base – easy peasy. I’m still perfecting my mix of spices though. Might give this recipe a go next time. Thanks Jules – and enjoy your trip down south to the snow — brrrrrr. Can the pita crumbs be skipped? I want to make falafel, but I’m allergic to gluten. Yes. Definitely. I make falafels at home all the time without pita crumbs. I have seen many falafel recipes and websites.Many people don’t use pita crumbs. 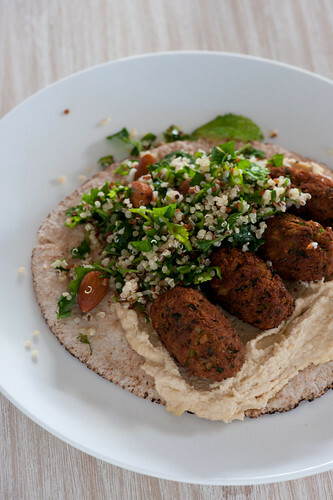 Actually this is the 1st falafel recipe I have seen that says to use pita crumbs. Thanks for sharing your experience Cathy! i was just telling my boyfriend i could make him falafel. glad i have a recipe now to back up my claims! Can you share your tabbouleh recipe too? Also, the pitas in the picture look yummy and I’ve heard they are easy to make so wondered if you make those yourself? I spent some time in Israel a few years ago, traveling from north to south. I had some of the freshest and tastiest falafel ever while I was there as well! I curious if one of the places I stopped in was the one you visited! But this recipe looks delicious, I should try making my own falafel sometime and see how it compares. Gosh, that falafel looks great! There’s a street in the Marais in Paris with several little restaurants where you can have falafel that looks half as good for (i’m sure) three times the price! Thanks for the gorgeous pictures. You make a very different hummus to me. I’m afraid I need more convincing to use the “canning” water. Whenever I use canned chickpeas I rinse and drain them really well and I would never dream of using the canned water, so this is very interesting to me. I usually prefer to use dried chickpeas that have been cooked. I cook a potful and freeze the rest in small bags. It is so handy that way to add directly to a dish or use for hummus. I also add paprika and cumin in mine, a couple of tablespoons of extra virgin olive oil and some warm water as needed to help reach a smooth consistency. I use a good quality salt for seasoning. Different folks, different strokes. Hummus is my favorite dip! I think it’s all about the balance between tahini and good quality olive oil and of course, fresh garbanzo beans. You convinced me with the GourmetRabbit draw… let’s see if I can’t get lucky! By the way, I’m loving your recipes more and more as I try them out. Just wrote up the white bean and walnut puree on my blog (were you aware that it is DIVINE on cold apple slices?? ), and I will be tossing together another chickpea and parmesan salad the very next chance I get. Thanks for the tips, and I can’t wait to see what’s next for you! I don’t know why I don’t make hummus and falafel at home! They are such great vegetarian protein. I will have to try these recipes out, stat. I have been making your three ingredient cake and talking it up all the time, by the way. – my fiance, who is a hummus snob due to having a best friend who is israeli, forbids me from making hummus with canned beans. Can you explain a bit about why you think it’s better? – also, in the hummus recipe, you say to add the tahini in the first blending and then again later. how should it be divided? Hopefully this recipe will work out better than the last time I tried to make hummous – my eldest still refers to the disaster it was whenever I attempt something new (“hope it’s not like the hummous mum”.. Charming! Question though – have had issues finding a tahini I like – is there a brand you recommend? I lived in Amman for 2 years when I was a child – would give a lot to go back – and not ONLY for the food though that’s a large part! Love that country! I love hummus and falafels. This recipe looks great too. Thanks! Aww, look at all of us hummus lovers coming out!! Yours looks great Jules. It is different the 2 recipes that I use, but I’m sure we are almost all using a different recipe. I think it’s really clever to keep it to so few ingredients. The whole meal looks so yummy. I have one recipe which has ”everything” I guess, complete with spices, tahini etc. Then I also have another recipe which, brace yourself…has no tahini in it. I was going through a tough time at one stage and tahini is a big expense added to the shopping so my friend shared her ”no tahini” hummus recipe with me. I still use it a lot because even now because, although it’s different, it’s nice and I’m into minimalism so it often saves me from having the tahini clog up my fridge. There is NOTHING else I use tahini for! lol. I love your Mediterranean inspirations !.. Gabi, some people (like me) are really sensitive to the tinned flavor of canned beans. And they seem to be a bit starchier overall than home-cooked. I prefer home-cooked when I have time to fool with them; their taste is really superior to my tongue (but not everyone I know agrees.) Also, I can make other dearly loved chickpea recipes from the same batch. However, home-cooked chickpeas are really a time investment — they take forever to soak (but cook relatively quickly after that soaking). …great dinner sorted and it was delicious. don’t know wht I never thought of cooking falafel at home before – so light and tasty. Thanks! A little cumin and hot red pepper makes hummus truly extraordinary. I recently had cilantro jalepeno hummus that was quite good. Ahh I love hummus and falafel. And tabbouleh. I’ve always wanted to go to Jordan, so I’m very jealous! And yes, we vegans certainly have a penchant for hummus. I would recommend some ground cummin in the hommous. It gives that extra wow factor, probably 1/2 a teaspoon for your recipe. There is no going back once you do this… makes hommous truly delicious. So delicious! 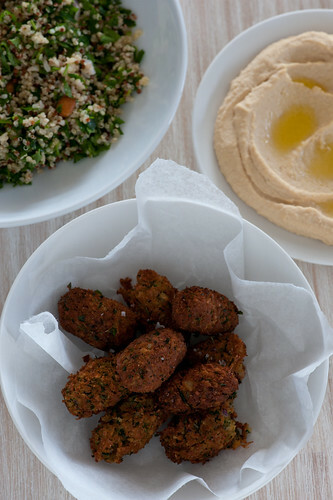 I made all three for dinner last night and it was amazing, and so simple, I couldn’t believe how easy the falafels were…except for the hot peanut oil jumping out of the pan at me. In the hummus recipe, you say to put the tahini in twice – was that a typo? And how big is your food processor? thanks for picking up the typo – all correct now. 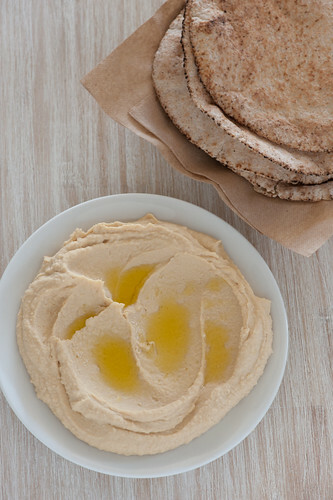 Looks delicious–homemade is so much better than supermarket hummus! My only problem with falafels is the deep-frying. So I found a recipe for baked falafel that doesn’t fall apart, because it’s made with sweet potato puree to help stick everything together. It’s from London’s Leon restaurant. I’m constantly screwing up hummus, but you’ve made it really simple here. I did add some cumin to it. Thanks! Sarah: For falafel falling apart issue, I’ve found that adding a little flour solves this problem. Ohhhhh do those look delicious! Thanks! i recently found my fridge overflowing with sweet potatoes and made this sweet potato felafel recipe. it was so delicious. we wrapped it in lettuce cups with hommus and a tomato and parsely salad, a raw beetroot salad, and a carrot and orange salad. the sweet potato makes the felafel balls so moist and sweet. also, as you may have noticed from to two comments in as many minutes, i really like your blog! I made falafels, hummus and tabouleh last nite for dinner mmmmm YUM!! Except my falafels fell apart, even when my oil was super hot and they were packed tightly :( what did i do wrong ? Sorry to hear your felefels fell apart – they can be tricky little things. But next time try letting them rest in the fridge for 1/2 hour before you fry – or add a little flour to the chickpea mixture..
Do you have a technique to turn hummus into falafels? Is it possible? Just made this today to celebrate accidentally buying a blender. So much better than out of a plastic tub, thank you. How long should it keep for in the fridge? 1-3 days or so? It will keep for at least a week… it’s pretty low moisture and the lemon juice helps as well..
Hello There. I found your blog using msn. This is an extremely well written article. Iâ€™ll make sure to bookmark it and come back to read more of your useful info. Thanks for the post. Iâ€™ll certainly comeback. you should certainly try Turkish style ! I’ve been browsing online more than three hours today, yet I never found any interesting article like yours. Itâ€™s pretty worth enough for me. In my opinion, if all site owners and bloggers made good content as you did, the net will be a lot more useful than ever before. made these two recipes today but added a little twist to both. with the hummus i made my own tahini albeit roasted the sesame seeds first. and with the falafel i added a some cilantro + chopped garlic and used the blender without washing it after having made the tahini. also i opted to be a little healthier and baked the falafels. btw how long will the tahini keep in the fridge? oh and one suggestion. i think these two would be great with a little turkish kisir !! I am just reading your hummus & falafel recipes because I want to try to make my own falafel instead of buying the pre-made versions. I do already make my own hummus, so that is a good start! What I would like to know is – if I could get away with baking the falafel instead of frying them. Do you think they would still come out flavorful? What I would do is spread a light coating of olive oil on the pan. Hey There. I found your blog using msn. This is an extremely well written article. I will make sure to bookmark it and come back to read more of your useful information. Thanks for the post. Iâ€™ll certainly return. Simply desire to say your article is as amazing. The clearness in your post is just nice and i can assume you’re an expert on this subject. Well with your permission allow me to grab your RSS feed to keep updated with forthcoming post. Thanks a million and please carry on the enjoyable work. I sent this post to all my friends, love it. This was worst falafels! Never again. You spoiled my dinner. Great recipes – been doing the same sort of thing for a month or so. Bought some shop prepared hummous the other day and never will again – tasted watery and unseasoned. Living in the Middle East you find the hummous changes from place to place. A Saudi colleague of mine who studied in Scotland swears that the best hummous he’s had comes from Tesco in the UK! Yes – falafels can be fragile and having to turn them in a pan when shallow frying makes it even trickier. I totally agree that freshly made falafel is the best! The kebab place at Spit Junction (NSW) makes them fresh when you order and it is so much nicer. I love making this homous as it’s so simple and tastes so delicious!